Today’s data centers are going through unprecedented growth and innovation as emerging optical standards and customers’ demands for higher-level networking services converge. Bandwidth, port density and low-power demands come as the main drivers that populate the deployment of fiber optic networks. And in fiber optic network implementations, pluggable optical transceiver provides a modular approach to safe-proof network design and become the ideal choice to meet the ever-changing network needs in data centers. This text just mainly introduces pluggable transceivers deployed in data centers. A Quick Question: What Are Pluggable Optical Transceiver? Pluggable optical transceivers are transceivers that can be plugged into routers, switches, transport gear, or pretty much any network device to transmit and receive signals. They are hot swappable while the device is operating, standardized to be interchangeable among vendors, capable of operating over many different physical medium and at different distances. For instance, pluggable optical transceiver can work through copper, through fiber optic cables available in both singlemode fibers (SMFs) and multimode fibers (MMFs), realizing 100m, 300m, 10km, 80km distance reach, etc. In addition, these hot-swappable transceivers are also able to support a wide variety of speeds, like 1Gbit/s, 10Gbit/s, 40Gbit/s, 100Gbit/s, or even higher. Just as what has been mentioned above, pluggable optical transceivers are interchangeable. These interchangeable transceivers allow a single device to operate with a wide selection of protocols and functions. Listed below are commonly-used pluggable transceiver standards and protocols. SFP—The small form-factor pluggable (SFP) supports a wide range of protocols and rates, such as Fast and Gigabit Ethernet (GbE), Fibre Channel (FC), and synchronous optical networking (SONET) for dual and bidirectional transmission. SFP medium are available in SMF, MMF, and copper. For MMF media, there exists 1000BASE-SX port type used in 1GbE applications. 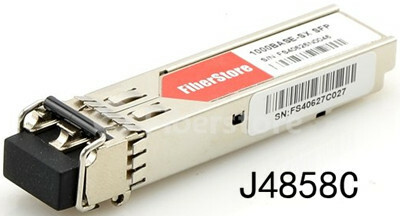 Take J4858C for example, this HP 1000BASE-SX SFP can realize a maximum of 550m reach at 1.25 Gbit/s over MMF. SFP+—The enhanced small form-factor pluggable (SFP+) is an enhanced version of the SFP, supporting data rates up to 16Gbit/s. It was first published on May 9, 2006, and version 4.1 was published on July 6, 2009, supporting 8Gbit/s FC, 10GbE and Optical Transport Network standard OTU2. SFP+ is a popular industry format supported by many network component vendors. XFP—The XFP (10G SFP) is a standard for transceivers for high-speed computer network and telecommunication links that use optical fiber. Its principal applications include 10GbE, 10Gbit/s FC, SONET at OC-192 rates, synchronous optical networking STM-64, 10 Gbit/s Optical Transport Network (OTN) OTU-2, and parallel optics links. QSFP—The Quad Small Form-factor Pluggable (QSFP) is a also a compact, hot-pluggable transceiver used for data communications applications. QSFP+ transceivers are designed to carry Serial Attached SCSI, 40GbE (100G using QSFP28), QDR (40G) and FDR (56G) Infiniband, and other communications standards. They increase the port-density by 3x-4x compared to SFP+ modules. In 40GbE applications, these QSFP+ transceivers establish 40G links with distances up to 300m over MMF, and 40km over SMF. QSFP can also take copper as its media option when the required distance is short. Like QSFP-4SFP10G-CU5M, this product is the QSFP to 4 10GBASE-CU SFP+ direct attach passive copper cable assembly designed for relatively short reach, that is 5m. The image below just shows what this QSFP-4SFP10G-CU5M product looks like. CFP—The C form-factor pluggable (CFP) is a multi-source agreement (MSA) to produce a common form-factor for the transmission of high-speed digital signals. The c stands for the Latin letter C used to express the number 100 (centum), since the standard was primarily developed for 100 Gigabit Ethernet systems. Pluggable optical transceivers offer distance extension solutions, allowing flexibility in network reach and easy replacement in the event of component failures. They are the answer to today’s network architecture and performance demands. FS.COM supplies various pluggable optical transceivers supporting different speeds, like SFP (J4858C), SFP+, XFP, QSFP, CFP, etc.